Modesto, CA - On 02-12-17 at about 2:30 p.m., deputies were dispatched to the 1700 Block of Wellsford Road in Modesto, CA for a body found on the side of the roadway. 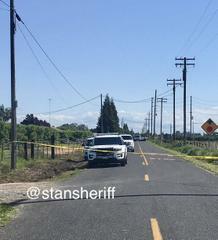 A Stanislaus County Public Works employee had been cutting grass on the shoulder of the roadway on Wellsford Road when the they saw what they believed to be a body and they called 911. 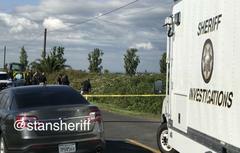 When deputies arrived they found what appeared to be an adult on the east side of Wellsford Road near some bushes. Detectives responded to the scene to assist with the investigation. It is not known how long the decedent had been on the side of the roadway. An autopsy will be completed to determine the cause of death and to identify the decedent. If you have any tips, you can leave an anonymous tip by calling Crime Stoppers at (209) 521-4636. Tipsters can also e-mail tips at http://www.modestopolice.com/CrimeStoppers, or text them to CRIMES (274637) by typing Tip704; plus the message and be eligible for a cash reward. Register to get free e-mail alerts and text messages directly from us via Nixle. Get detailed up-to-date e-mail and text messages specific to your community from the Stanislaus County Sheriff's Office by registering for Nixle Alerts; at: https://local.nixle.com/register.